Even though Japanese summers are unbearably hot and humid, tourists from all over the world still flock here to experience the country’s unique culture, amazing historical sites, vibrant festivals, and mouthwatering cuisine. Below is a sample 7-day Japan Rail Pass itinerary for a summer trip to Japan. After passing through immigration and customs at Narita Airport, look for a Japan Rail Ticket Office so that you can exchange your voucher for the actual 7-day Japan Rail Pass. You will need to fill out a form and show your passport for verification. Once you have the valid pass with activation date set on that same day, you can get a seat reservation on the next Narita Express train to get to Tokyo in less than an hour. What to see in Tokyo depends on your likes and interests. Tokyo has much to offer for people of all ages, with attractions scattered all over its 23 wards and municipalities. For shopping, dining, and entertainment, make sure to explore Shibuya, Asakusa, Harajuku, Ginza, Akihabara and Roppongi. They have a wide selection of malls, department stores and specialist shops offering local and international electronics, clothes, shoes, and other products; small and fine dining restaurants serving authentic Japanese and international dishes; and bars and clubs where you can enjoy concerts and performances by homegrown musicians, karaoke, and other events. For families, there are child-friendly museums such as the National Museum of Nature and Science, Fire Museum, Museum of Emerging Science and Innovation, RiSuPia Panasonic Digital Network Museum, and Ghibli Museum; and amusement and theme parks such as Disneyland and DisneySea, One Piece Tower, Namjatown, Tokyo Dome City Attractions, Joypolis, Legoland, and Hello Kitty World. For history buffs, Meiji Jingu, Senso-ji, Tennoji, Zozo-ji, the Imperial Palace, and Gokoku-ji should be on your list of must-sees. 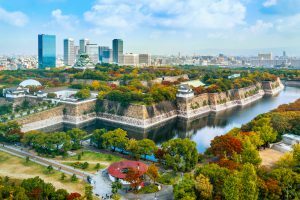 On the other hand, if a relaxing stroll is in order, you can visit the Shinjuku Gyoen National Garden, Koishikawa Korakuen Garden, Kyu Shiba Rikyu Garden, Yoyogi Park, Hibiya Park or Ueno Park. Alternatively, you can leave the busy metropolis behind and climb Mt Fuji, a nearly perfectly cone shaped active volcano that is one of the country’s most important and sacred icons. Climbing Mt Fuji is one of the most popular activities engaged in by tourists who visit Japan in the summer. From 10 July to 10 September, Japan’s highest peak opens up its trails and various mountain facilities to throngs of people who are ready to spend around 12 hours or so to hike up and down the 3,776-metre tall mountain. To get to Mt Fuji using your JR Pass, board a JR Shonan-Shinjuku Line train at Shinjuku Station and get off at Kozu Station. Then, transfer to the JR Gotemba Line going to Gotemba Station. The entire train journey takes about two hours. At Gotemba Station, get on a bus heading to Subashiri 5th Station. The 60-minute ride costs 1,540 yen (one-way) or 2,060 yen (round trip). Starting at Subashiri 5th Station, your hike to the summit will take between five and eight hours, depending on your fitness level. The descent, on the other hand, takes only three to five hours. While the round trip course can be completed in one day, you can also stay overnight in a mountain hut. When climbing Mt Fuji, it is recommended you only take the necessities (such as water, food and warm clothes). Arrange for your bags and luggage to be forwarded to your hotel in your next destination so you don’t have to carry extra weight on your climb. These takuhaibin or delivery services are available at major airports, hotels, convenience stores, supermarkets, and shopping malls. After you have conquered Japan’s most prominent and iconic mountain, head to Shirahama for more excitement. From Subashiri 5th Station, take a bus back to Gotemba Station. Then, using your JR Pass, get on the JR Gotemba Line going to Mishima Station. At Mishima Station, take a Shinkansen to Osaka Station, where you have to transfer to a Ltd Exp Kuroshio train to go to Shirahama Station. The bus and train journeys take about eight hours, so be sure to start the day early to reach Shirahama before night falls. 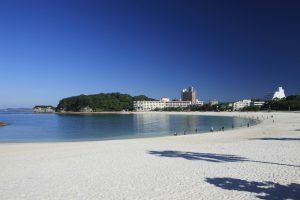 Shirahama Beach, which literally translates to “white beach”, is one of the top attractions in Shirahama. It is 500 metres of fine, white sand and blue waters that offer a wide array of activities, including sunbathing, swimming and surfing. And, during summer, it holds fireworks displays every night. It also offers a wide selection of hotels that provide rooms with stunning natural views. In addition to the beach, Shirahama has other must-see attractions, particularly museums, amusement parks, ancient rock formations, and onsen. To learn more about the history of the area, visit the Minakata Kumagusu Museum, a museum with exhibits that feature renowned scientist and writer Minakata Kumagusu; the Onsen Shiryokan, a museum that tells the beginnings and progress of onsen through the centuries; and the Kishu Museum, which contains artifacts gathered from Japan’s pre-modern era. If travelling with kids, Energy Land and Adventure World are two amusement parks that are highly recommended for fun and interactive experiences. 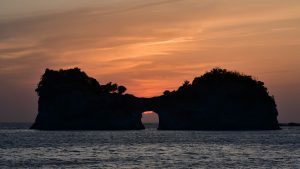 For outdoor adventure seekers, the cliffs and caves of Sandanbeki, and the beautiful rock formations of Senjioki and Engetsu Island are must-sees. Shirahama is also one of the top three onsen destinations in the country, along with Kyushu’s Beppu and Izu Peninsula’s Atami. Shirasuna, an onsen by the beach, has a large bathing area that has room for up to 100 people. However, unlike traditional onsen, it requires guests to wear bathing suits as it is in plain view of everyone passing by. Another beachside onsen is the Sakinoyu, which is an outdoor bath more than a thousand years old that offers fantastic views of the sea. Next stop on the itinerary is Osaka. From Shirahama Station, take the Ltd Exp Kuroshio line to Tennoji Station, and then transfer to the JR Yamatoji Rapid Service going to Osaka Station. The entire trip is covered by the JR Pass and takes about two and a half hours. In Osaka, you can choose to spend an entire day at Universal Studios, Osaka Aquarium, and other amusement parks; or a morning checking out Osaka Castle, Shitennoji Temple, Sumiyoshi Taisha, and other historical sites and an afternoon trying a variety of local streetfoods and specialty dishes in Dotonbori; or shopping for clothes, arts and crafts, and souvenirs in Umeda and Namba. If you are flying out of Kansai Airport in Osaka, you have two transportation options using your JR Pass: take either the JR Haruka Limited Express Train or the JR Airport Rapid Train from Tennoji Station or Shin-Osaka Station. If flying out of Narita Airport, take a Shinkansen from Shin-Osaka Station to Tokyo, and then catch the Narita Express going to Narita Airport.